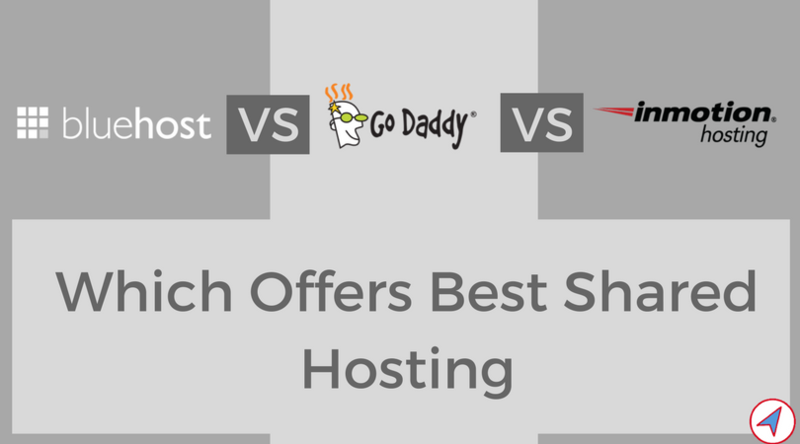 It becomes really hard to decide which Web Host is the best when there are so many veteran Web Hosts like Bluehost, Godaddy, InmotionHosting etc. If you are in same dilemma, this article might help you to get through. Building a website is no less than building a house. Every house needs a physical address. Similarly every website have a domain name as an address and this is how people find your website. But one of the most important thing is the foundation which your house is to be built on. Yes, Foundation in our example is the “WebHost”. A solid web host makes sure your visitors would never have a problem reaching your website. One thing I do every year is transfer my website from one web host to another web host to avoid high renewal charges. During last 3 years, I have tried Bluehost, Godaddy and InmotionHosting shared hosting. As a beginner you tends to choose Hosting which have a lot of positive reviews and is fairly priced. I paid $58 for the first year when I had only a few hundreds of visitors while currently paying only $25/year for thousands of visitors. This is only because now I know how much should I pay for what I need. In the article I am going to compare 3 popular hosting websites – Bluehost, Godaddy and InmotionHosting. Rather than comparing hosting based on uptime, speed, performance, UI, Support and a lot of graphs, I would simply try to explain one thing – For what money each web Host can handle what no. of visitors without going down. This article is going to be more relevant to those who are planning to start a new blog or looking for a reliable host to migrate existing website having less than 100k Visitors per month. The blog you are landed on was first hosted on Bluehost in 2015. Because it was my first time and I was reading a lot of reviews. Every another blogger was recommending Bluehost so I gave it a try paying $58(Basic Plan) for the 1st year. But was it worth paying this much? Renewal was unaffordable so next year(2016), I migrated this blog to Godaddy. 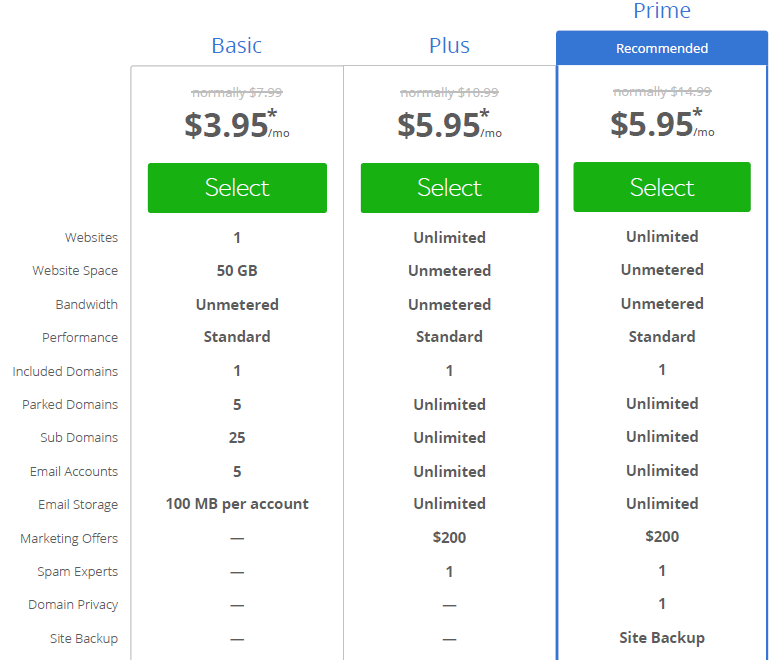 I was not sure if ‘Starter Plan’ of Godaddy’s shared web hosting would be able to handle my traffic, so I went for ‘Economy’ Plan paying around $55. First month of Godaddy was horrible. Those red color warning emails were really scary – ” You’re at your resource limits. Visitors might have trouble accessing your site”. My blog was getting around 1200 visitors per day. I removed some plugins and optimized site. Still I was getting those emails occasionally throughout the year. Always felt like I should buy and add some resources. WordPress hosting is entirely different from Linux/window Shared hosting. 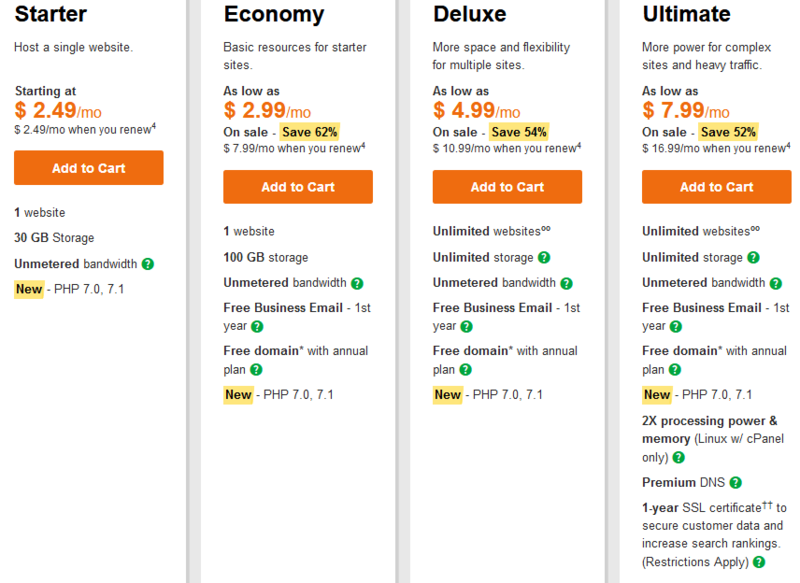 Last year I purchased Godaddy WordPress hosting basic plan to host one of my blog. I was not happy with their Linux shared hosting but since I was hosting a WordPress website, I gave WordPress hosting plan a try. WordPress hosting is supposed to be specially optimized for WordPress websites and Godaddy WordPress hosting performance was beyond my imagination. Basic plan can handle up to 25000 unique visitors per month but there was a time when I was getting more than 4000 visitors per day still my blog was up all the time. So I would say you should always go for WordPress hosting to host a WordPress blog. Only downside of Godaddy WordPress hosting is that they don’t provide a CPanel like other hosting but software like Filezilla are always there to access all hosting files. Next year(2017), I moved my website to InmotionHosting. 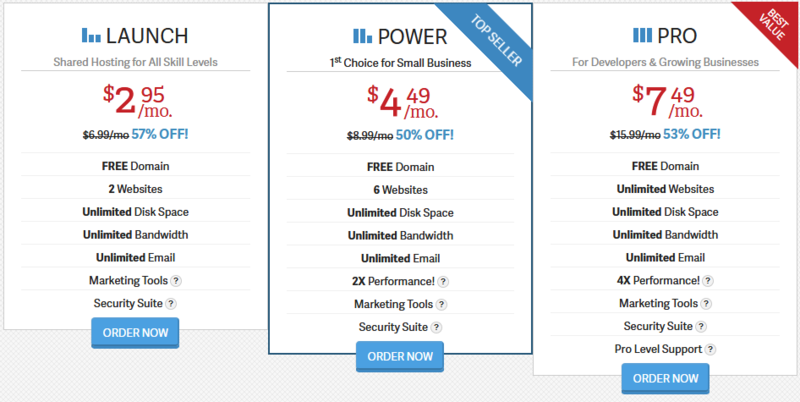 Ended up paying around $55 for Launch plan at InmotionHosting including free domain transfer. User interface was bit old but with the help of online chat support I was able to transfer my blog to inmotion shared hosting without any problem. Honestly speaking, I never had a problem with them. Website was smoothly working even with 1800+ visitors per day. Although loading time of website was little increased if I compare with time when I was with bluehost and godaddy. A quick comparison based on Support, Uptime, Performance, Money Back Guarantee etc. Bluehost and godaddy provides almost similar CPanel/backend while InmotionHosting Cpanel/AMP looks little outdated. I had to contact Inmotionhosting via chat to simply unlock my domain name. I mean things are little less user friendly there. It’s hard to beat Godaddy at Price. You can start a blog with godaddy as low as 99 Rupees per month. InmotionHosting comes at second position. All the three web hosts offers 99.9% uptime guarantee. I got little lower pagespeed on Google Pagespeed tool when I was using InmotionHosting because of low server response time. Godaddy and Bluehost are almost same. If you are not happy with a hosting company, you can get your money back. InmotionHosting offer you 90 days to decide, godaddy gives 45 days and Bluehost 30 days. 30 days might be too early for someone to judge hosting service so InmotionHosting is a clear winner. You are always advised to read terms and conditions regarding money back guarantee because in some cases you might only recover partial money. Why Shared Hosting is Enough for a New Blog? Some blogger might suggest you VPS, dedicated or a managed hosting plan for your blog. Off-course you are provided with a lot of resources(Ram, Bandwidth, processing power etc) with such specialized hosting but I really don’t think a new blog need this. Because it’s a new blog and you don’t expect a huge number of visitors in first year. It takes little more time to reach that level. So go with the basic plan and focus on optimizing your website. Cut down number of unnecessary plugins, scripts to make sure your website does not need a lot of computing resources to run smoothly. Hosting alone can’t make you fast, you have to put efforts in optimizing your website at your end. Say if you are lucky enough and shared hosting is not enough to handle your blog, there is always an option to upgrade your hosting plan. You can upgrade to a higher plan any time in between. Conclusion – Which Web Host is the Best? Overall if you have less than 2000 visitors per day, you can go with WordPress Hosting and shared hosting plans. So this was all for now. Share it if you find it useful. Looking forward to hear your experiences with these Web Hosts via comments. your blog gave me new direction to think. My blog was on automobile, but after seeing your blog I think I should take it to other diamentions too. Thanks. You are writing on multiple things. This is great advice! Very honest and practical. I really enjoyed this post. Thanks so much for a detailed post! It is very helpful for. Your post is helpful to avoid the mistakes. This is great advice! Very honest and practical.